Stay Staffed cloud-based management software facilitates cost savings, staff retention and morale for employers of all types and sizes. 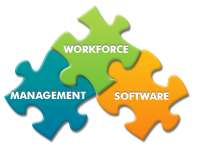 Our Vendor Staffing Management (VSM) staffing solutions require no investment in hardware or software and have proven effective in increasing productivity and reducing operational expense. Stay Staffed web-based management software enhances candidate pools provided by staffing agencies by enabling you to mobilize a contingent workforce without third-party assistance. Optimizes open positions, boosting fill rates quickly. Fosters relationships within your pool of qualified candidates. Integrates fully with a suite of Stay Staffed staffing solutions. Innovative technology by Stay Staffed empowers organizations to create brand identity and loyalty with an unlimited base of qualified contingent workforce candidates. Attracting top talent is vital to the success of your organization. By implementing Stay Staffed management software, you demonstrate care and concern for the life balance of your current staff, boosting referral rates and encouraging positive word-of-mouth.